Mike Napoli; has been running marathons and competing in Iron-man triathlons since his 30s. Typically, he would race in one event monthly from March through November. Because of work travel and family – along with age – Napoli has a bit slower pace. He’s still a fitness enthusiast, for sure, including biking, running and cross-fit training multiple times a week. However, two of his weekly workouts at the Crossfit Milk District gym are with his 6-year-old granddaughter, and there are some moves he simply can no longer do, like pullups because of shoulder surgeries. So, he doesn’t try them. “I scale [my workouts] back to make it as hard as possible on myself, but also not to the point we I’m going to hurt myself,” says Napoli, 53, a software developer in Orlando. Jamie Lynch; is perhaps even more of a workout warrior. The 54-year-old is a nurse practitioner for cardiology practice (Orlando Health Heart Institute), which likely helped when in January he ran the Celebration Marathon’s 26-plus miles in 3 hours and 32 minutes and qualified for the 2019 Boston Marathon. Self-described as a fitness “addict,” Lynch, 54, a Winter Park resident, can be found swimming and biking across Central Florida’s lake and roads, starting at 5 a.m. But he knows the clock is ticking toward inevitably slowing down and transitioning his routine while still trying to remain fit. Because of eye-muscle weakness in his youth, he didn’t play sports growing up. As a young adult, he then found weightlifting, until his lower back and knees weakened. Then he found running until a move to triathlons (running, biking and swimming), which enabled him to better manage the stress loads on his body. Now, he awaits his next transition. He will eventually change his routine, but he won’t ever stop, Lynch quickly adds. “Bodies in motion stay in motion. … There’s nothing I like to do more than exercise. My wife says I’m a better husband when I do some training, conditioning,” Lynch says. Getting older, of course, is a life reality. Yet, so too is the need to continue to seek some level of fitness in your advancing years – adjusting as you go. People like Napoli and Lynch will certainly tell you as much, as does the International Council on Activity Aging. The ICAA has a section on its website called Welcome Back to Fitness, starting with the very basics of getting a checkup, knowing your workout options and determining your participation style – all before actually exercising. According to the American Heart Association, you should exercise 150 minutes a week of exercise, or 30 minutes a day at least five days a week. That includes people over age 50 – in fact, especially those people. 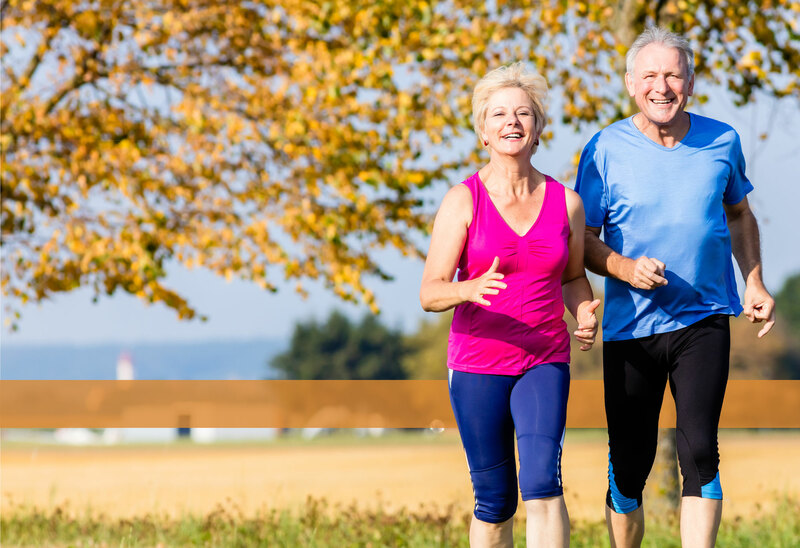 The AHA points to a study released in 2017 study that showed people with stable coronary heart disease who increased their habitual physical activity reduced their mortality rate – with the greatest benefits seen in sedentary people who began to move regularly. In another 2017 study, researchers at University of California San Diego School of Medicine reported that elderly women who sat for more than 10 hours a day (with low physical activity) had biologically older cells compared to women who are less sedentary. That wouldn’t be news to Elsie Sierra, 71. After her husband died in 2002, she sat around and “did nothing for five years.” They used to run a half mile or so together as he battled with diabetes, but when he passed, she stopped. Then about 10 years ago, after never having been to a gym, she joined one. “Somebody told me I needed to change and asked ‘why don’t you go to a gym?’” Sierra recounts. 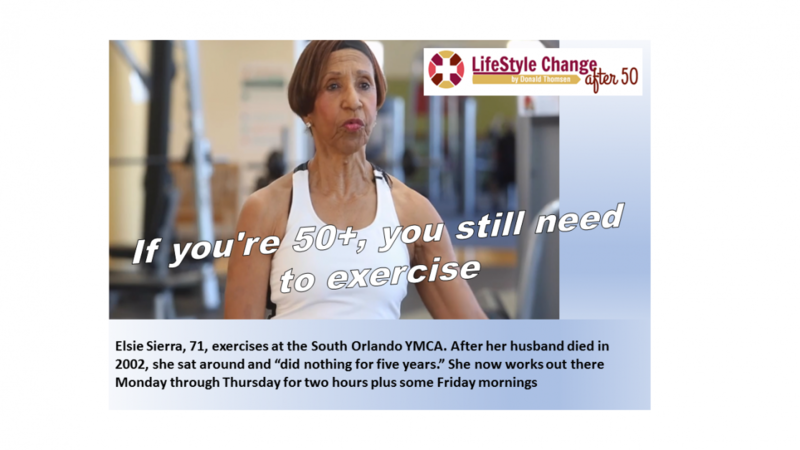 That gym was the South Orlando YMCA near her home. Today, Sierra works out there Monday through Thursday for two hours plus some Friday mornings. “When I first went there, I looked around and didn’t know what to do. Then I started cycling and got motivated,” she says. Sierra moved from cycling to stair-stepping then to weight machines. Always thin, she now can lift a 30-pound barbell over her head with each arm. “I’m 71 and I can say that I feel like a 30-year-old. Nothing hurts,” Sierra says, noting the lone exception of tendonitis in her right thumb. Also, her moods are better. “If I don’t go to the gym, my [adult] daughters tell me I get cranky. … My stress, I leave it here [at the gym],” she says.